If you like the Listen Up! show, interesting items that may be of interest to you will also be posted here as well. Enjoy! Each of these releases of 100 records will be accompanied by one mini documentary video of a featured artiste for that week. These are pretty special, as the artistes have been chosen by Sheila, John’s wife, and their children – so they are all artistes who meant something to John and his family. 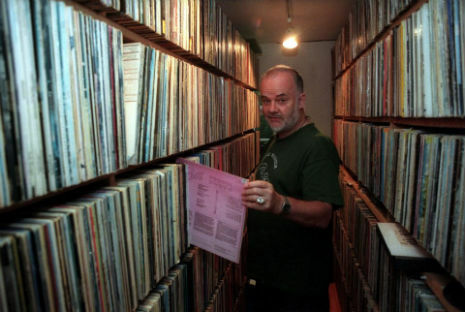 When you come to the website you will see John Peel’s home studio, from which you will be able to access the contents of the record collection as it is added each week, as well as other videos added each week, photos, peel sessions and radio shows. Once in the collection you will be able to move up and down the shelves of the record collection, picking out certain choice records and going through the first 100 as though you were standing in front of the shelves in John’s studio. You will be able to see the hand-typed cards that John diligently typed for every album in the collection, the record sleeves, as well as listening to tracks via spotify and itunes where available. And because we know that John meant a great deal to many people, we will be helping you to connect with other music lovers and Peel fans through our John Peel Archive social media accounts. Look out for never-before seen material, like letters to John, being exclusively released via social media. This will also be a great way to stay up to date with new material being released each week – so please do ‘follow’, ‘like’ and say hello – we want to hear from you and your stories of John. In our heads throughout the planning process, has been making sure that we do John (and his fans) proud and ensure that the legacy of this legendary man lives on. Check out some of the selections here. Next ›Worth Repeating: Revolution Now!